Disable the Barriers exists to propel disability rights to the forefront of society while providing tools to those fighting to remove the physical, psychological, cultural, political, and educational barriers that prevent progress. Video of the Disable the Barriers co-creation workshop. We are challenging ableist language to create opportunities for progressive discourse using posters that highlight and showcase the true meaning of words like perfect, standard and normal. We are working to remove the stigma of being disabled by confronting our fears of mortality and the loss independence by inspiring action and engagement. 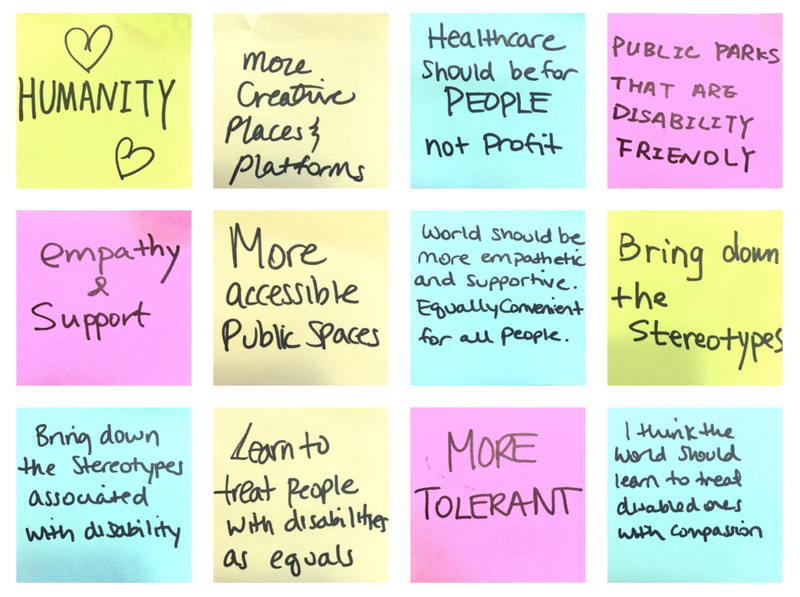 We will advocate designing "with" instead of "for" people with disabilities by working to disable barriers that prevent people from accessing spaces and using products. 85% of the people with disabilities are not born with their impairments, they acquire them by living in the world. By 2050, there will be roughly 6.25 billion urban dwellers, 15% of which will be living with a disability. In the United States, 64% of disabled people, between the ages of 18 - 64, are unemployed. If you are interested to learn more about Disable the Barriers, if you want to be featured on our "Friends" page, or if you want to contribute in any way to this platform, kindly write us a message.